I was in charge of organising a weekend brunch/lunch for about 10 people. Our challenging group included at least 2 babies (and possibly more), one vegetarian and a varied collection of tastes. I was nervous when I chose East Terrace Continental as reviews on the internet were mixed. Still, we were a group of old friends, we used to go to etc when we were at uni, and one of us was visiting from New York. I figured that things could really foul up and I’d be forgiven. Things didn’t get off to an awesome start … I turned up and I could see no large table set up and ready with high chairs. And at midday on a Sunday you don’t turn up to etc with a big group and expect to wing it. Now etc had done the smart thing and rung me the day before to confirm (I’d had to ring back and leave a message) but I suspect I was looking pretty nervous and ticked off when the guest of honour arrived. After a fair bit of faffing around my booking was found, some customers were moved and our table was pulled together. I don’t know the extent to which this was good planning or good luck on the part of etc, but I commend the staff for their can-do attitude in sorting things out. Table sorted, our group filtered in in dribs and drabs. etc is very casual which makes it perfect for a large group. You order and pay at the counter. This is perfect if you have people on different schedules (we did) and also if you have people who are money sensitive in any way (ahem). 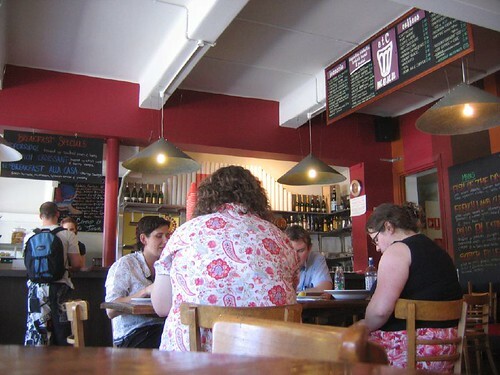 Also, the café runs a very sensible policy on breakfast – it’s served until 3:30pm (they close at 4pm). This meant that I was able to indulge in a huge smoked salmon and scrambled eggs, with asparagus, while those around me ate a proper lunch, or a sandwich, or whatever they fancied. I certainly wouldn’t go as far to say my breakfast was the best I’ve ever had – I like my scrambled eggs really soft and these weren’t, and the asparagus was a tad under cooked, and the silly (large) size of the portion meant that everything didn’t stay as hot as might have been ideal. But really – why quibble? The feed set me back $14.50 and I would go back and order the same thing in flash. Or would I? Because there are quite a few things on the breakfast menu I fancy trying. Around me plates were cleared so I guess everyone else was happy too. Most importantly, the coffee at etc is good! So decent food, good coffee, not too expensive and a sizeable range of vegetarian options. We ended up staying for about 3 hours and at no point did we ever feel like they wanted to move us on (maybe we drink a lot of coffee …). Yes, etc is noisy and buzzy (and busy) but I think that’s exactly why people go there. Ignore the internet and give it a whirl!